It has been few weeks since I moved in to our new house and I love it. I am constantly working on improving it and making it look homely. We have had quite a bit of furniture from our previous apartment but this place is much bigger and needs some new additions. I was looking for those items that can add luxury touches to my new home but can be versatile and I can move them around if needed. I wanted pieces that can be used in the living room as well as the bedrooms or I could use them for filming background for my videos. I knew I wanted to buy a lovely floor lamp as that was one item that we could not fit in to our old apartment. Although it was big enough we just had too many things already and it would not fit anywhere. I chose this Mala Harpin Tripod Floor Lamp from Cult Furniture. I feel its modern yet chic design will fit our existing furniture and I can use it in any of the rooms. At the moment it is that great feature item for our living room and I love how it looks there. I picked neutral tones as that is simply safe option for my taste and my current decor. I was also after a chair or armchair that would feel more classic and I could use it again in any of the rooms. If we had more guests and our sofas would not be enough this could be used or I can simply use it in one of the bedrooms for more decoration purposes. It can also be that item that makes your empty corner more homely and you can enjoy cup of tea and favourite book in it. I was deciding in between two models but in the end opted for Keaton Armchair in grey. I love the fact it is velvet fabric which I feel is very trendy in home decor at the moment but the fact the armchair has got wheels was a great feature for us. It enables me to move it around and suit our needs. So this item is simply a winner and it already fits our home in the best possible way. I am so delighted with both items from Cult Furniture and cannot wait to keep improving our new home even more. Uz je to par tydnu co jsme se prestehovali do noveho domu a mam opravdu velkou radost. Pomalu upravujeme co je treba a snazime se vytvorit prijemny domov pro nas vsechny. Z predchoziho bytu jsme meli docela dost nabytku, ale tim, ze dum je vetsi, je treba par novych veci a to bude asi postupny proces. Chtela jsem si poridit par veci, ktere budou fungovat ve vsech mistnostech a budu je treba moci pouzit k toceni na youtube. Velmi casto vyhledavam veci, ktere budou vypadat dobre ve vsech nasich mistnostech, protoze me zkratka bavi veci menit podle potreby ci chuti. Jednou z veci kterou jsem vzdy chtela, ale v nasem predchozim byte na ni nebylo misto, byla velka lampa. Jelikoz mam rada spise neutralnejsi veci ( i kdyz to se take casem muze zmenit) vybrala jsem si tuhle krasnou Mala Hairpin lampu. Prijde mi velmi sik a zaroven moderni a velmi se nam hodi do obyvaciho pokoje. Dale jsem si prala novou zidli nebo kreslo, ktere by se hodilo kamkoli, at jej muzu pouzivat dle potreby. Pokud napriklad prijde navsteva a nebudou stacit nase pohovky je dobre mit alternativni sezeni. Zaroven jsem chtela, aby kreslo mohlo byt pouzito treba k toceni a mohla ho pouzivat dle svych potreb. Rozhodovala jsem mezi dve modely, ale nakonec vyhralo tohle kreslo Keaton v sede barve. Libi se mi, ze je ze sametu, coz je momentalne v oblasti dekoru velky hit. Navic ma tohle kreslo kolecka, coz mi usnadnuje premistovani z mista na misto a to je presne co jsem si prala. Jsem rada, ze jsem tyhle kousky do domu poridila a tesim se na dalsi vylepsovani. 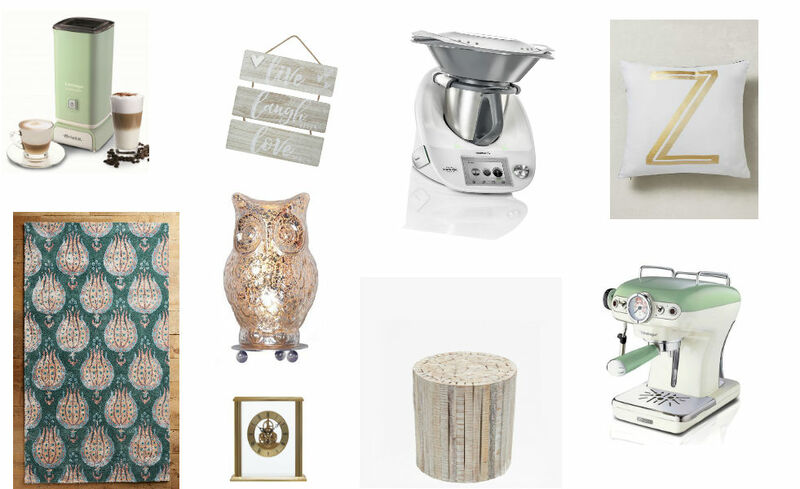 What to gift to home decor and household lovers? There is not that long until Christmas however I know so many people that even haven’t started their shopping. I was few weeks ahead with publishing my gift guide for beauty and fashion however not everybody is about shoes and lipsticks. To be quite frank I like both. LOL What an ideal situation happy and healthy family and then you find your favourite pair of shoes with new coffee machine that has got incredible design. Plus points for the husband right? A good coffee machine is always a good present for coffee lovers. I totally fell in love with design of this gorgeous Ariete model. And if somebody is a fluffy milk fan you can get this from the same range. If your budget does not reach that level but you still want to gift something nice you can buy a lovely mug, dining sets, interesting clock or gorgeous and unique cushion. If your budget is reaching higher and you know that your loved one loves cooking they will absolutely love Thermomix. I cannot get over how much work this does for you and actually your kitchen stays quite clean when cooking. What else to ask for? And if you know people that love gorgeous dining sets and dining in general you have to check out Anthropologie as they have some stuff that will blow your mind. Well, Christmas is almost here so happy shopping and even happier holidays. Do Vanoc nam zbyva jeste par dnu, ale mam kolem sebe tolik lidi, kteri nemaji jeste ani jeden darek. Vzdy se takovy clovek najde. Ja jsem uz pred par tydny vydala clanek s napady na darky, ale to bylo spise pro milovniky mody a kosmetiky. Ne vsichni ale miluji rtenky, boty a parfemy. Najdou se i lide, kterym nejvetsi radost udela pomocnik do domacnosti ci neco krasneho z domaciho dekoru. Ja vam nebudu lhat, chci idealne oboji. No neni to skvele, kdyz se sejde u stromecku stastna a zdrava rodina a ceka na vas vysneny par botu, ale take uzasny kavovar s jeste uzasnejsi designem? Dobry kavovar je pro milovniky kavy idealnim darkem. Ja jsem se zcela zamilovala do tohoto krasneho kavovaru od Ariete a pro opravdove fajnsmekry muzete poridit i napenovac mleka ze stejne rady. Do me kuchyne se hodi naramne a kdo sleduje muj youtube, tak to urcite pochopi. Pokud vas rozpocet nesaha treba na neco drazsiho, urcite potesi i mensi darek jako krasny polstar, zajimave hodiny ci porcelan. Ja mam uz nejakou dobu zalusk take na kuchynskeho pomocnika Thermomix, ktery prakticky dela vse za vas. A navic jak to tak vypada, bude vase kuchyne i uklizena. Co vic si prat, ze? A pokud chcete nekomu udelat radost napriklad hezkym jidelnim setem urcite se podivejte do nabidky Anthropologie, protoze jejich veci mi doslova berou dech a myslim, ze nejen me. Kazdopadne Vanoce jsou temer tady a proto vsem preji prijemne nakupovani a jeste prijemnejsi oslavy.